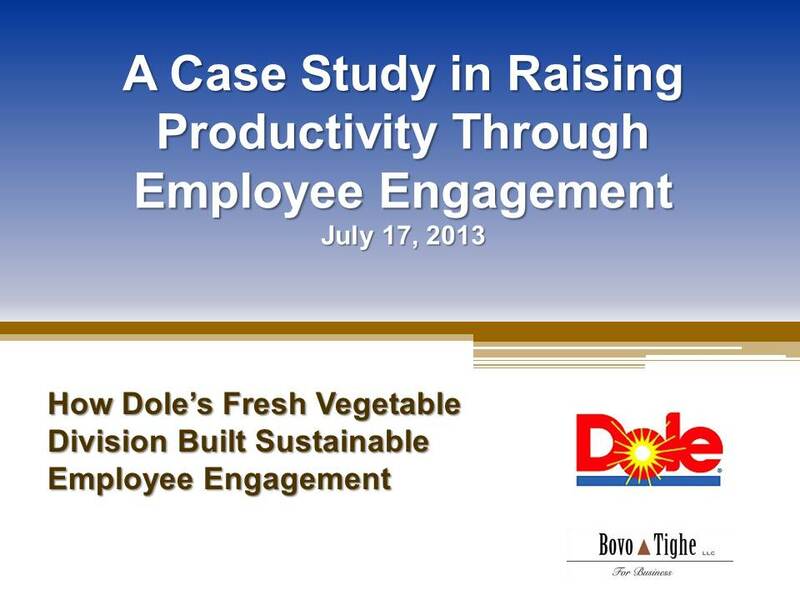 We had the honor of working with our client, Dole Fresh Vegetables, to present a case study in how employee engagement can sustainably raise workplace productivity at the recent HR Star Conference in South San Francisco. The case study grew out of survey feedback we received from previous HR Star presentations, in which audience members asked for more details about just how an organization can leverage a program of employee engagement to raise productivity. 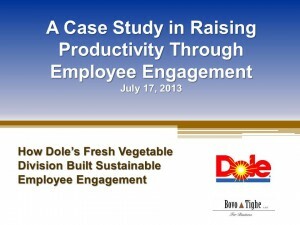 Suzanne Shaug, Director of Human Resources for Dole Fresh Vegetables (DFV), agreed to present the program with us and take questions about her mission, methodology and results from the audience of about 150 HR professionals. Better match employee talent set to job DNA, to raise job satisfaction, and therefore productivity. Enhance interpersonal skill sets to improve the frequency and quality of interdepartmental collaboration, to improve efficiency and foster greater innovation in project work. Doubled the rate of retention in those departments that participated in the program. Reduced man-hours for exempt staff by 20%, from an average of 55-60 hours/week to a 45-50 hour/week for middle managers. Managers reported improved ability to complete tasks on time, improved quality of work, and better morale. These results were largely due to the improved relationships with other departments that reduced duplicate work, sped up the work of cross-functional teams without sacrificing quality, among other efficiencies. Working smarter, on projects that everyone understands and approves of, with sufficient input up front, all play a role in reducing the hours required to complete given tasks. What are your success stories? What gains has your organization made through the application of personal development tools like Dynamic Communications, triads, 360s and the like? We would love to hear about your experiences.